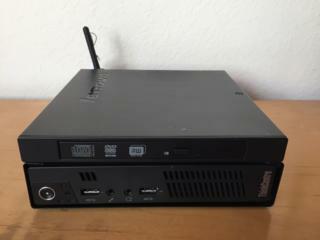 This refurbished desktop computer is compatible with ArcaOS. It features an Intel i5 dual-core processor, 8 GB RAM and a 500 GB hard drive. A 2 TB solid-state hybrid hard disk is an optional upgrade. This computer is configured to boot ArcaOS. No Windows is installed, nor are instructions provided to install Windows without harming the ArcaOS installation. A boot menu offers either the ArcaOS installer, located on drive X: or the ArcaOS operating system, located on drive J:. A generous amount of free space is available for operating system installation. Only 512 MB RAM are available using the IBM OS/2 Loader. Using the ArcaOS Loader 3437 MB are available. The balance of the 8 GB RAM can be used as a RAM drive. Arca Noae USB stack 11.17 works well with Lars Erdman's USB Audio driver and a Trond USB audio adapter. The network driver is MultiMac32-MMRE. I installed ArcaOS on drive J: with minimal options. Most programs were added by Suntan Special afterward. I installed Suntan Special, I run Suntan Special sequences ArcaOS50, apps, games and cleanup. This is saved as the Factory image. This is normally what would be supplied on the computer. Sound support is great using the default UniAud except that the sound comes only from the built-in speaker, and nothing from the front headphones. So external speakers are not going to work with Uniaud. To fix this, I uninstalled Uniaud and replaced it with Lars Erdmann's USB Audio driver and a Trond USB sound adapter. Sound works very well. A trial version of RSJ CD-Writer is installed to provide DVD and CD writing. Continued use requires a license. Blonde Guy will install your current RSJ license if you provide it on the order form. Suntan Special was used to bring the system up to date on December 11, 2018. The recovery DVD supplied is a modified bootable ArcaOS DVD with a backup of the hard drive as delivered. You can boot the machine from DVD, and perform maintenance functions. The factory backup is stored in the \image\Factory directory. The backups are simple zip files. You can use unzip to extract some or all of the files in a backup. Power consumption is 20 Watts, measured with the computer is booted to the desktop. With both cores at 100% load, the computer consumes 35 Watts. This computer consumes 1 Watt if it's plugged in, but switched off. With monitor and keyboard to show the size. The monitor, keyboard and speaker are for the purposes of illustration, and are not included with the computer. The disk is partitioned into ArcaOS installer and ArcaOS volumes. You can use the ArcaOS volume (J:) as is, or you can create your own ArcaOS volume out of the free space. This is the layout for a 500 GB hard drive. The final price of the computer depends on tax, shipping and options.